Gas fireplaces built-in insert, available 90F cm and 130F cm wall models. It creates an atmosphere with a long flame view, like a widescreen cinema size. 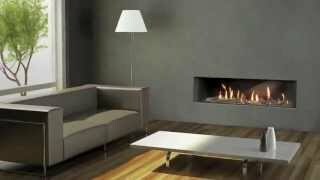 Gas fireplaces built-in insert, avaible 90 cm and 130 cm models with 3 sided. It creates an atmosphere with a long flame view, like a widescreen cinema size. Visible flame surface for model. 90F wall installation - L 836 mm X H 320 mm. Visible flame surface for model. 130F wall installation - L 1369 X H 320 mm. Balanced Flue, sealed chamber, Running by LpG & Natural Gas. Casing for redirecting the heating flow equipped standard. Designed & Assembled in Italy.